What is the difference between ‘caramel’ and ‘carmel’? Both words sound similar. The pronunciation of ‘caramel’ can vary widely by region of English speakers, so sometimes the words are actually homophones. However, while ‘caramel’ is a dictionary word, ‘carmel’ may not be found in an ordinary dictionary. How can an English speaker know the difference in the words, and what is the correct pronunciation? ‘Caramel’ is a cooking word noun. It comes from the process of cooking sugar until it is slightly darkened and burnt. The resulting sugar is then called caramel, and it is used to give color and flavor to foods, often sweet ones. For example: I sprinkled caramel sugar on top of the cupcakes as garnish. ‘Caramelized’ is the verb form of this word that means this process. Many foods that contain natural sugars can be caramelized. For example: I caramelized some onions for the sauce. Along the lines of this, ‘caramel’ can also be defined as a soft light brownish candy made from butter, sugar and milk or cream. For example: I like eat caramel candy because it is soft and chewy. ‘Carmel’ on the other hand, is a proper noun. It is a popular beach town in California, also called Carmel-by-the-Sea. It is also a Mediterranean location found in the Bible. It comes from Hebrew and is a portmanteau, or combined word, meaning ‘God’s Vineyard’. Mt. Carmel is a related location. So because of this, ‘Carmel’ is found in other proper names of people or places. For example: She went to Our Lady of Mt. Carmel school. The pronunciation is generally “KARR-mel” or “KARR-mul”, with both being understood. Because ‘caramel’ and ‘Carmel’ are obviously spelled differently, it would seem that they would not be homophones. However “KAR-muhl” is actually an accepted pronunciation of ‘caramel’. While the reason for this is not entirely known, it is speculated that the dropping of the ‘uh’ sound in the middle of the word became a habit because the Biblical location of Carmel is so widely known and recognized. Another reason is that in American English, native speakers tend to delete the post-medial schwa when it follows the stressed syllable. This is not an unusual occurrence for the pronunciation of a word in English, especially when it is adapted into the language from a foreign one that may seem difficult to pronounce for some speakers. ‘Caramel’, originally from Spanish and then French, has been in use in the English language since the 18th century. So perhaps out of an error of pronunciation to sound like something more familiar, over time it became a correct pronunciation and even a fashionable one in some areas. 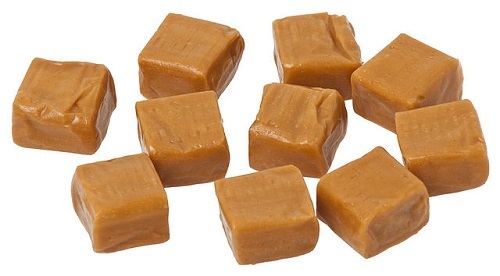 Whatever the reason, depending on where a person lives, ‘caramel’ can also be pronounced “KARR-uh-mel”, “KARR-uh-muhl”. Primarily though, only North American speakers use the “KARR-muhl” pronunciation, and even then it only tends to be in the Midwest and West Coast areas. British pronunciation favors “KARR-uh-mel”. Although there may be several acceptable pronunciations of ‘caramel’, be aware that many regions favor one or the other. It is always best to use the pronunciation you predominately hear people using to be best understood. Aaron Hutchinson. "Difference Between Caramel and Carmel." DifferenceBetween.net. June 8, 2016 < http://www.differencebetween.net/language/difference-between-caramel-and-carmel/ >. Correction: Caramel is browning sugar & then adding heavy cream.